It was a happy day when I saved enough to buy my first SUP. Overwhelm hit as soon as I set foot in the store. There were 50 + boards on offer, each with its own selling point. I turned around and went straight home to do some research. Now I know the difference between each board, I’ve taken to writing about them. What follows is my review of the Fanatic Allwave – have a read and decide whether it’s for you. The Fanatic Allwave – WhatSUP! 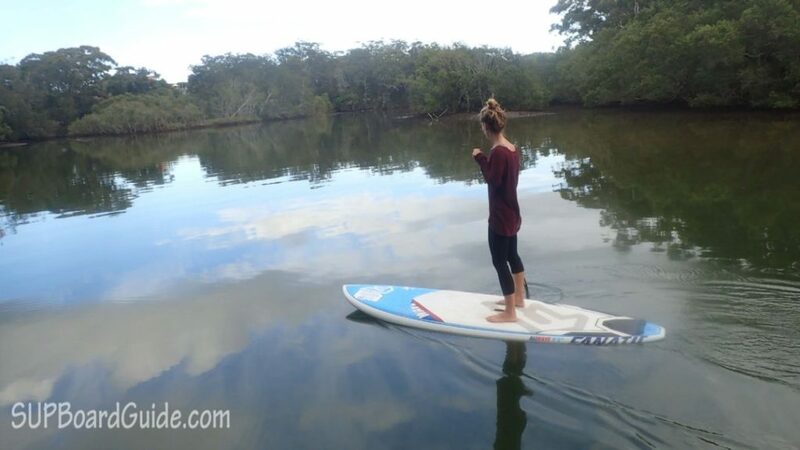 Though it’s cruiser friendly, the Allwave was shaped with the intention of being a surf SUP. The Fanatic Allwave is the best all-rounder in the surf; this means it’s stable, fast and easy to turn. Why is it the best all-rounder in the surf? As a beginner, you’ll enjoy its wide frame for stability in moving water. If you’re an intermediate wanting to test your skills in the surf, you’ll find it easy to takeoff and turn with. Consider yourself a more experienced SUP-er? You’ll enjoy being able to switch between riding it as a thruster (3 fins) or quad (4 fins) depending on your mood. The Allwave performs in waves small or large. It’s a tough board with a light frame. In other words, you can throw one at a wall, and it won’t even leave a dent or break your back! 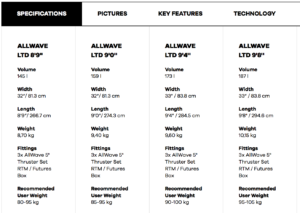 You even have the luxury of choosing the Allwave in a few different sizes. Each series has released between 3-5 different sizes ranging from 7”11- 9”8. Size matters. Your board size will be dependent on your weight. More on that in a moment. 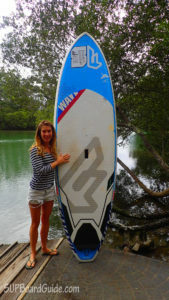 The design of the Allwave (being shorter and fatter than a standard SUP) means it’s advertised and sold as a surfing SUP. 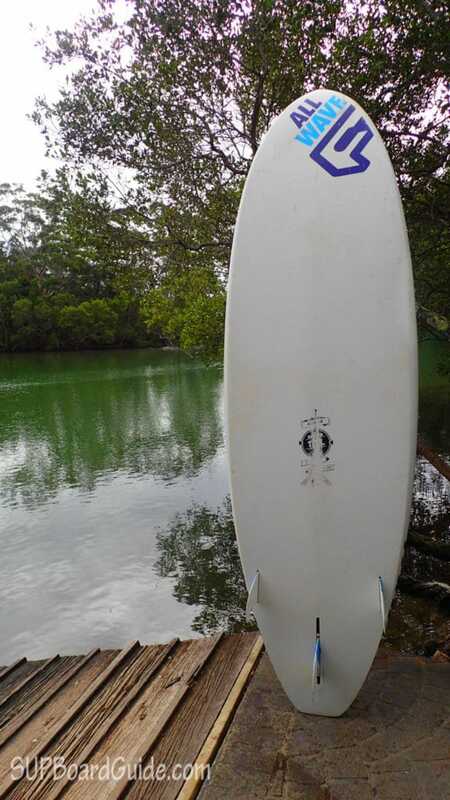 However, it’s still a great board for flat water or small waves. 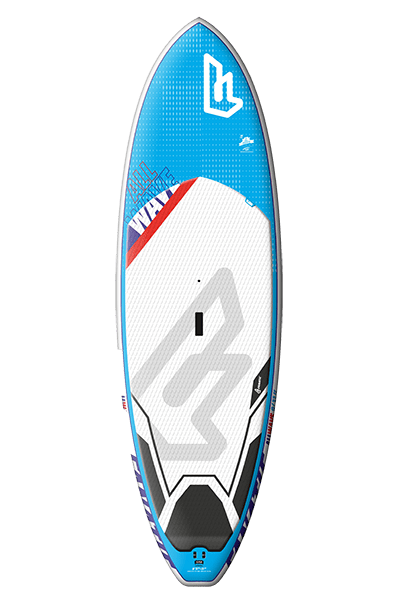 The only fallback when using it in flat water in comparison to touring boards (recommended flatwater boards) is the extra paddling you’ll be doing. This is because touring boards are bigger and have more surface area, making it easier to gain momentum in water. Whether it’s heavy or sloppy waves on the menu, the Allwave performs well. The pintail (back of the board that comes to a point) makes the board very responsive to back foot turning, and the thin rails (edge of the board) makes these tight turns easy to execute. By now you can see how the Allwave is a clear standout. Previously I touched on the Allwaves extra features, and now I’ll explain them further. The Quad/Thruster setup – Use the Allwave as a quad (4 fin setup) for tighter turns or as a thruster (3 fin setup) for extra speed. Lightweight and tough – Hardly a ding after a major collision with some rocks left me wondering if I was riding cement. If that was the case, I shouldn’t be able to carry it, right? (I only weigh 50 KG). The lightweight build of the Allwave will impress you when you realize how tough it is. Fanatic not what you want? If you’re not sold on the Allwave here are three alternatives that you might like. 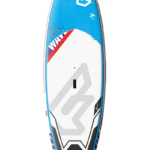 Fanatic Prowave – The Prowave is a little tighter in the tail and the body. This means when compared to the Allwave the Prowave is better suited to heavier conditions. Riveria Voyager – The Voyager is designed for speed and stability in flat water. Combine this design with its huge length (12ft), and you get a great beginners board. These factors make it a much better-suited board for flatwater conditions than the Allwave. 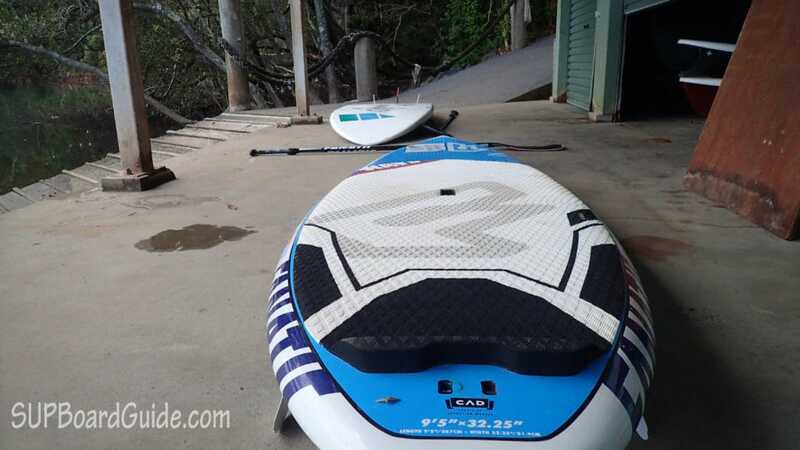 Naish Nalu 11”4 – The Nalu is definitely more suited to flat water with its huge length. The fun part is that it’s also superb in small surf. You’ll want to use the Allwave more in the surf but the Nalu more in flat water. So if you want to have a board for both, the choice is yours. You just need to decide where you’ll spend more time. The Allwaves flexibility for all conditions and skill levels make it a hard board to beat. The lightweight frame means it’s easy to transport. The larger than average width makes it beginner friendly while the pintail and tight rails allow someone more experienced to ride it as a performance board. The fact that it can be used as a windsurfer is top notch too. 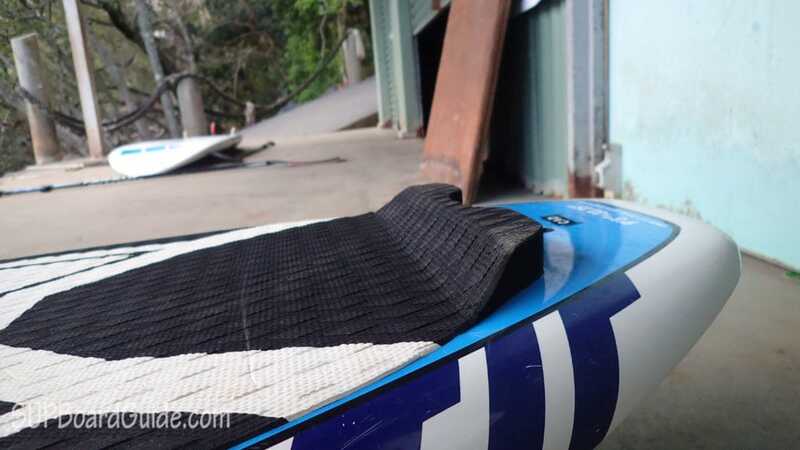 If you’re set on using your SUP for river cruising or charging massive waves, the Allwave may not be the best option. It’s wider body and nose makes it more work to execute the extreme turns and steep takeoffs you face on bigger waves. You’ll have more luck in 6 foot+ surf with something narrower. While on the river, you’ll enjoy your time more with a bigger board to help you gain momentum while cruising. However, if you’re getting out in the surf for the first time or if you’re already shredding it up out there, the Allwave is a great choice. Just remember – have fun! That’s what it’s all about at the end of the day. Smiles and waves! 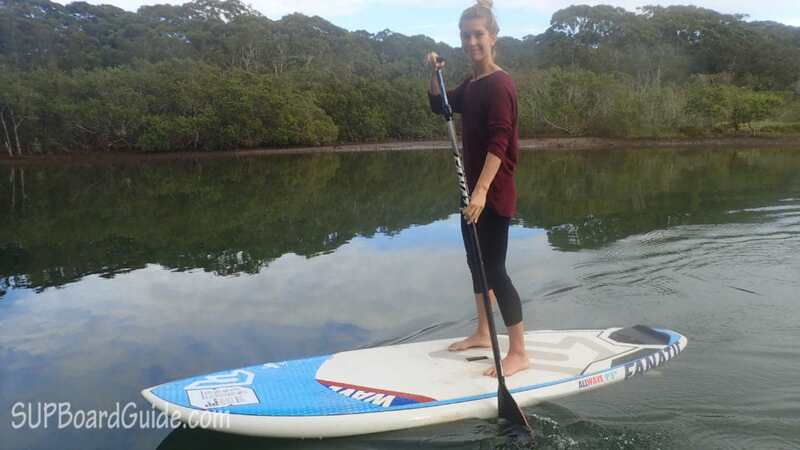 Happy SUPing!